With all the undue Emmy love this show has just received, I'm feeling a bit more dour on it than it probably deserves. But the truth is, there was just something about it that left me cold. 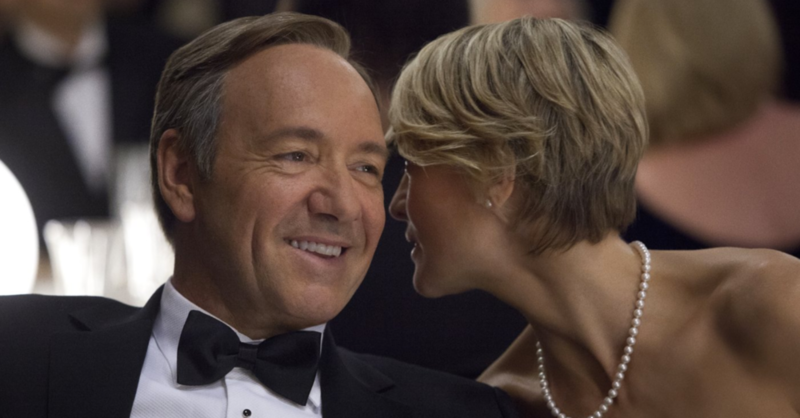 It certainly has the right pedigree, with David Fincher involved in directing the early episodes, and big movie actors Kevin Spacey and Robin Wright in the lead roles, and the production values on this thing can rival the best of HBO. And it's another show about a cynical male antihero (that I'm getting sick of), who's navigating through the dark, ultra cynical world of DC politics- this whole thing was a recipe for Emmy success that I'm now embarrassed I didn't see coming. But despite the fancy set dressing, in the end it all felt a bit hollow, and the pretension it wants to project is all surface and no substance. That may be a little harsh, because it's not as if there's nothing of value in the show. The dialogue from head writer Beau Willimon is theatrical at times but usually smart and steeped in realistic sounding political jargon (although I'll admit that once again I prefer Aaron Sorkin's West Wing any day). 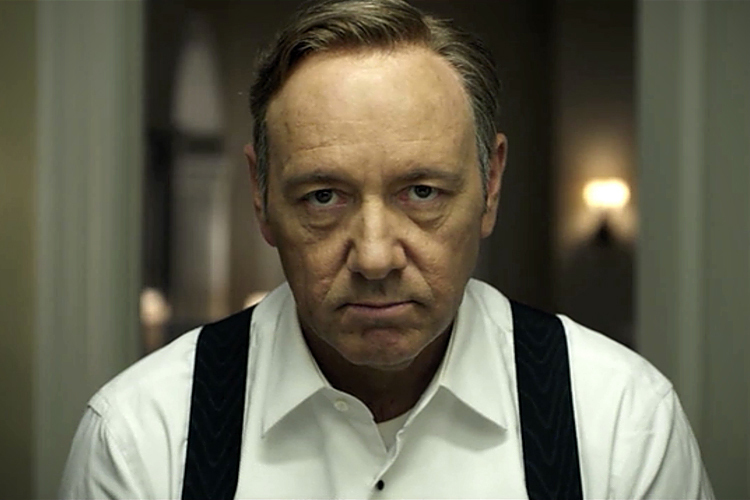 And the lead performance from Kevin Spacey as Congressman Frank Underwood is always entertaining, but you know what? He's done this part before. The snarky, backstabbing, sarcastic used-car salesman act- he's done it so many times that it seems old hat for him. 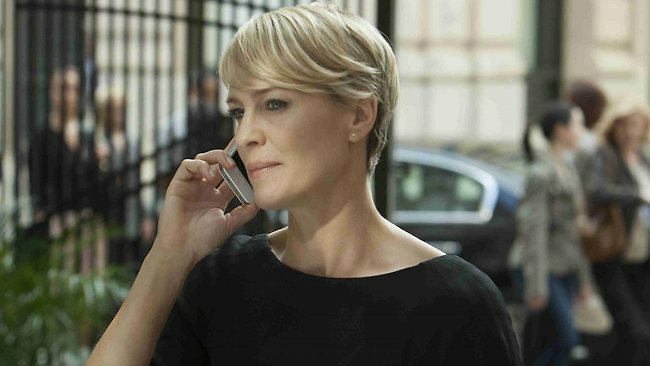 Robin Wright as his equally cynical and manipulative wife chose to play the part with a cold, steely reserve, and be unemotional throughout the season- it draws you in at first, thinking that she's a woman who may be hiding secrets, but by the end it feels like a fairly empty character who's made up of nothing but hollowed ambition. That was my problem with the two characters here- to me it felt like there was no real internal drama lurking below the surface after a while, just cold, cynical people being cold and cynical with not much else going on. That goes for much of the supporting cast as well. Kata Mara plays the ambitious young reporter whose goals in life are solely to get ahead, seemingly making her a perfect match for Spacey's antihero, and yet she turns out to have nothing going on upstairs in the end either (not to mention that performance just doesn't work at all for me, and seems less like an acting choice to be unemotional and more like a January Jones-esque, can't-change-the-expression-on-my-face rigidity). The more that I look back on this show, the more I think what really saved the season was the performance of Corey Stoll, and his tortured, helpless Congressman Peter Russo, who became the victim of the Washington monsters who used him shamelessly. Stoll infused this character with a complex humanity and a vivid inner turmoil. He was the only person in the cast who felt alive at times and I often wished he could have been the focus of the series. Especially now that, SPOILER ALERT, he can't be on the show next season, I really wonder how it's going to fare without him. And yes, there were some insanely complicated and unlikely plot twists involving Frank's machinations and ultimate goals throughout the season- you're going to have to suspend disbelief on a similar level as Homeland, which is asking quite a lot, considering that this show takes itself even more seriously than that one does. Still, I was willing to go along with all that by taking into account the fact that this show was being adapted from the early 90's British version starring Ian Richardson, and was more or less faithful in translating all the same events to US politics and spreading it out over 13 episodes (the original was 4). That takes some doing and Willimon was pretty impressive in accomplishing it. So, ultimately, I'm going to keep watching because I am interested in seeing where it goes, but this is the one new show of the year that gave me serious reservations, and to see it showered with all this Emmy love over some far superior shows has me thinking they all fell for the pedigree more than anything else. So be careful with that when you watch this, because it almost fooled me too- it's only in the last few episodes when things are wrapping up that you begin to see all the false plot twists and unlikelihoods and the ultimate shallowness of these characters reveals itself more plainly. Shallowness on its own isn't a negative, but if the show doesn't realize they're shallow and thinks it's been treading in substance this entire time...then there's a bit of a problem. July 18, 2013 by Ariel Shavonne.